Ready to eat. Used as a side dish with rice, noodles or bread. 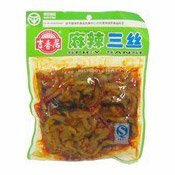 Also can be used as seasoning when cooking dishes. Ingredients: Pickled Mustard Tuber (30%), Turnip (18%), Kohlrabi (15%), Kelp (10%), Chilli Oil (Rapeseed Oil (5%), Chilli (3%)), Salt, White Granulated Sugar, Garlic, Soy Sauce, Cooking Wine, Sichuan Pepper, Spices (Siamese Ginger, Chinese Anise, Bay Leaf), Flavour Enhancers (E621, E635), Acidity Regulators (E330, E270, E260), Preservative (E202). 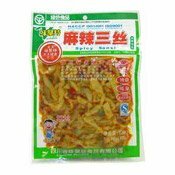 Simply enter your details below and we will send you an e-mail when “Spicy Sansi (吉香居麻辣三絲)” is back in stock!